Barry and Trudy Gainford came to New Zealand from South Africa with their children Kendal and Daniel in 1994. 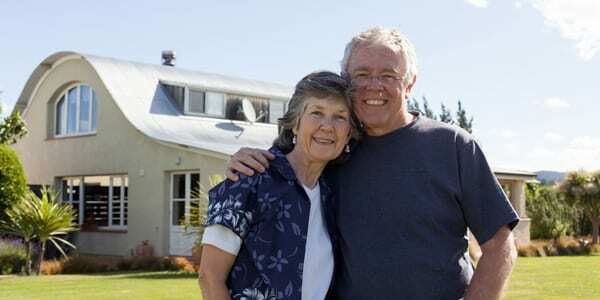 Originally born in the UK, but having spent most of their lives in Rhodesia, Barry and Trudy found the NZ lifestyle very similar to that of Rhodesia. They therefore instantly felt at home in New Zealand, and settled very happily in Blenheim. The 2 acre property they purchased in 1997 gave them a love for the land, and the many animals they tended and cared for over the following 17 years. 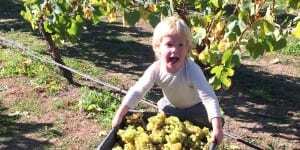 Taking the property from a blank canvas to a delightful garden, an enormous vegetable garden, and an orchard filled with a great array of fruit trees, gave them a love for wholesome organic produce. 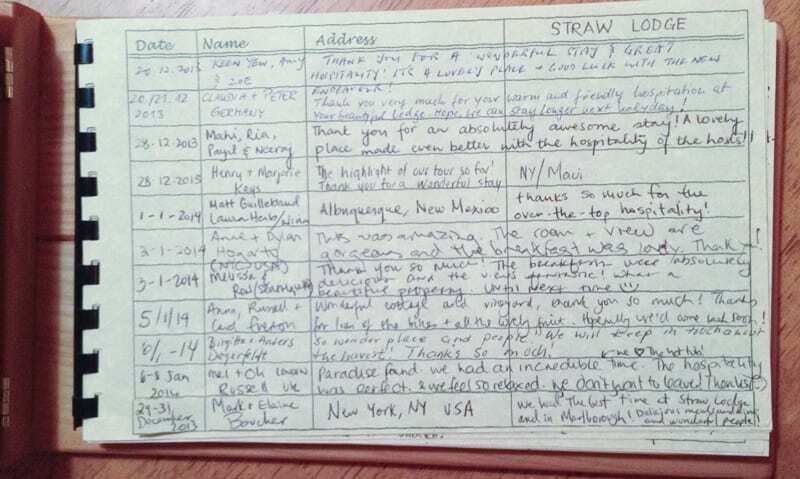 So it was the next step in their adventure to purchase Straw Lodge in December 2013. The plan to enable their daughter Kendal, and son-in-law Mike, with their 3 young children to live in a separate dwelling on the same property is working out really well. 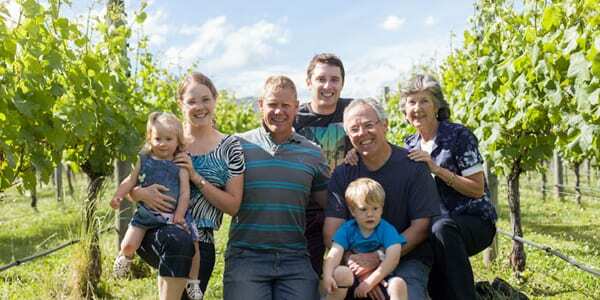 Barry is still very involved with his lifelong vocation of being an Optometrist so with Mike running the organic vineyard assisted by Barry, and with Trudy running the homestay assisted by Kendal, it’s a real family affair! Our love for people, and our desire to bring pleasure to others is perhaps the underlying reason why we are enjoying our lives to such an extent here at Straw Lodge. Long may it continue!! We are passionate about our environment and very aware of the need to take good care of it, for our grand-children and yours. The initial concept, design, building process and the on-going management of Straw Lodge and the vineyard has been based on this premise. Straw Lodge was built with an in-fill of straw bales which give the Lodge and the Guest Suites superb insulation. Double glazing enhances the insulation properties. The buildings are painted with a breathable, non-toxic paint and the woodwork is finished with natural oils. Home-milled and demolition timbers were used for both the buildings and furniture and everything was designed and built on-site. Domestic water is sourced from our own well then double-filtered and treated with an ultra-violet light process. The gardens and orchard are mulched with waste-paper and straw plus an application of garden compost which lead to better organic produce, fruits and vegetables. We harvest our own olives which are cold pressed to produce pure virgin olive oil for family and guest consumption. Supplied toiletries are locally made and contain only natural vegetable oils and pure essential oils. Only ‘environmentally friendly’ cleaning products are used. Where at all possible, all local products and organic produce are extensively used and promoted. We are a supporter of the local Farmers Market and local artisans. Please enjoy the garden produce, the ambience of the buildings and surrounds, the private out-door courtyards and the BBQ areas. 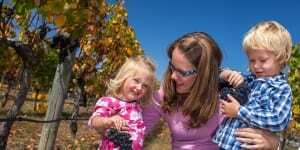 Fully immerse yourselves in the lifestyle of a sustainable winegrowing operation and visit nearby organic vineyard tasting rooms and restaurants to experience the best of Marlborough.